The city of Santa Barbara is getting into the pop-up shop business. Retail and restaurant entrepreneurs looking for a short-term storefront space in downtown Santa Barbara engaged in a speed dating-style event Wednesday that paired businesses to property owners and brokers. 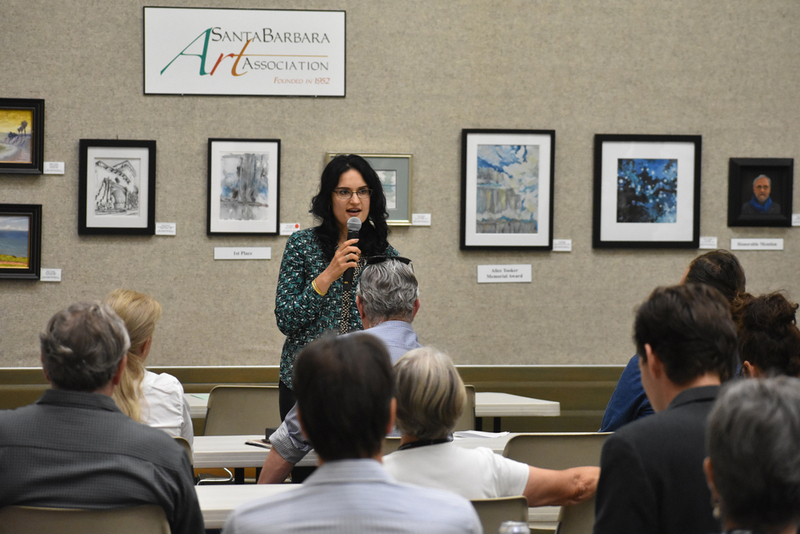 More than 50 people gathered at the Santa Barbara Central Library Faulkner Gallery to pitch their pop-up plan and get introduced to business leaders and prospective tenants with property agents who have vacant space downtown. Entrepreneurs had four minutes to share their ideas and ask questions, and storefront space were not guaranteed at the event. Santa Barbra rolled out the initiative to encourage the short-term retail pop-ups downtown, where businesses forego building improvements and alterations, saving money and time in construction costs, and there is no building permitting requirements, said Nina Johnson with the city, who is spearheading many of the downtown initiatives. “We want to re-energize downtown and get some of the vacant spaces filled,” Johnson said. Santa Barbara has more than 15 vacant locations available for potential pop-up shops, of various sizes. Caryl Cantrell, specialty leasing manager at Macerich, which owns and operates La Cumbre Plaza on Upper State Street, said pop-up shops are a valuable business opportunity. Specialty leasing brings additional income to the shopping center, in addition to the permanent, long-term leasing, Cantrell said. The spaces have great flexibility with rental lengths, Cantrell said. According to the Santa Barbara pop-up guidelines, applicants are required to have a business license with the city, and no alcohol tastings are allowed unless it’s sold through an event license. The pop-up use must be consistent with the storefront's previous permitted type of business, and no improvements, alterations or modifications to the building are allowed. Cynthia Reynoso took part in Tuesday’s gathering to get information on pop-ups for her husband, Dave, the owner of Dave's Dogs Grill on Turnpike Road near San Marcos High School. They're considering opening a new pop-up restaurant in downtown Santa Barbara. Possible spaces for pop-up locations include: a 2,500-square-foot space at 427 State St.; a 1,300-square-foot space at 429 State St.; a 1,654-square-foot space at 430 State St.; a 3,300-square-foot space at 509 State St.; a 2,200-square-foot space at 609 State St.; a 1,935-square-foot space at 619 State St.; a 2,640-square-foot space at 627 State St.; a 1,384-square-foot space at 819 D State St.; a 2,250-square-foot space at 907 State St.; a 3,979-square-foot space at 913 State St.; a 1,750-square-foot space at 933 State St.; a 3,020-square-foot space at 1013 State St.; a 1,150-square-foot space at 1014 State St.; a 2,300-square-foot space at 1019 State St.; a 6,500-square-foot space at 1029-1031 State St.; 1 West Canon Perdido; and various spaces at Paseo Nuevo and La Cumbre Plaza on Upper State Street.